New RS4 Avant storms into Frankfurt with a 0-62 mph time of 4.1 seconds. Audi Sport made a splash at the Frankfurt Motor Show last night with the reveal of the rear-wheel drive R8 V10 RWS. If that wasn’t already a headline reveal, Audi's Sport division has now lifted the wraps off the all-new generation RS4 Avant, storming into Frankfurt with some serious performance upgrades over the standard S4 Avant. Powered by the same twin-turbo, 2.9-liter V6 engine lifted from the RS5 Coupe, this wild wagon produces a whopping 450-horsepower and 443 lb-ft of torque. The power output is the same as the last-gen model, but torque has risen by 125 lb-ft thanks to turbocharging. As a result, the new Audi RS4 Avant only needs 4.1 seconds to accelerate from 0-62 mph, before topping out at an electronically limited 155 mph. An optional RS dynamic package is also available, which boosts the top speed to 174 mph. Power is sent to all four wheels through an eight-speed automatic transmission, and a rear-mounted differential is available as an optional extra. Matching its potent performance are a host of brash exterior upgrades, including aggressive air vents, oval exhaust tips, and a roof-mounted rear spoiler to set it apart from its standard sibling. 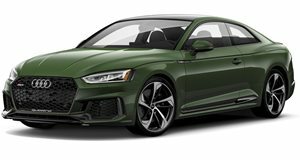 According to Audi, the design is inspired by the legendary 90 quattro IMSA GTO race car, with a familiar RS honeycomb structure, a wide, flat Singleframe grille, and wheel arches that are 30 mm wider than the regular AV Avant. It also harks back to the original first-generation RS4 Avant that launched in 1999, sporting the a similar Nogaro Blue paint finish available only from Audi exclusive. Compared to the standard A4 Avant, the new RS4 Avant sits seven millimeters lower to the ground and is fitted with 19-inch wheels. A set of 20-inch wheels can be optionally fitted. The cabin contains a head-up display and digital Audi Virtual Cockpit with RS-specific displays that indicate the g-forces, tire pressures and torque. It can also be tailored to personal tastes with a wide range of customization options through Audi’s Exclusive program. Orders for the new Audi RS4 Avant will start this fall, with prices starting from €79,800 ($95,674) in Germany.